C.A. Stoddard Sr., publisher of the Craig-Empire Courier and president of the Colorado Press Association in 1935, was presented with this stunning Plains Indians headdress in appreciation for his contributions to Colorado Native American people. 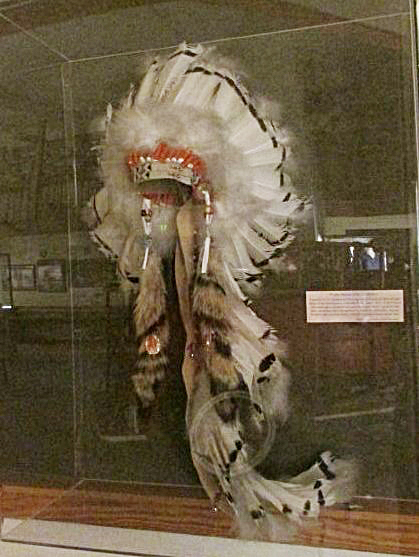 The headdress is now a prominent piece of the Museum of Northwest Colorado’s “Native Peoples” exhibit. Samantha Johnston, general manager of the Aspen Times and former executive director for the Colorado Press Association, just happens to be a former Craig resident, but she is not the first from this area to hold the Colorado Press Association position. In the 1930s — a time that presented huge financial challenges to the state’s newspaper industry — the local publisher of the Craig Empire-Courier, C.A. Stoddard Sr., was the president of the press association. He was active not only in the newspaper arena, but his influence spread beyond to other organizations and interests. At some point during his tenure in this position, Stoddard made a significant contribution of service or recognition to the Native Americans of the Colorado region. In September 1935, Stoddard was invited to Manitou Springs to a special gathering where Chief Tafoyo, of the Tewa tribe of the Pueblo people, presented him with a traditional plains Indian headdress. Additionally, at the time of the presentation, Stoddard was given the name “Tunyo” (chief) by those who considered him a special friend and had gathered to honor him. Stoddard returned to Craig with his prize bonnet, and decades later in 1989, his wife, Lena, donated it to the Moffat County museum, then housed in the center of the courthouse. When the museum opened as the Museum of Northwest Colorado in its new location on Yampa Avenue, the headdress was placed on display with other Native American artifacts. Recently, the museum has upgraded its Native American exhibit area with new lighting, additional artifacts and a new case to highlight the exquisite headdress that so generously was given to the county 25 years ago. With many changes and upgrades this spring, the museum is almost ready for Craig’s annual kickoff to summer’s Grande Old West Days. Be sure to include the museum on your activity list for that weekend and for summer. With wildlife exhibits, regional history exhibits, the railroad exhibit and the world-renowned Cowboy and Gunfighter Collection, the museum is a great place to entertain out-of-town guests. The museum is open Mondays through Saturdays with free admission. For more information, call 970-824-6360 or visit us at http://www.museumnwco.org.